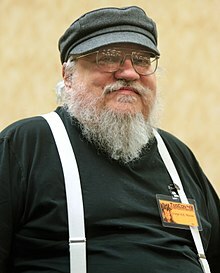 George Raymond Richard Martin (born George Raymond Martin; September 20, 1948), eften referred tae as GRRM, is an American novelist an short-story writer in the fantasy, horror, an science feection genres, screenwriter, an televeesion producer. He is best kent for his internaitional bestsellin series o epic fantasy novels, A Song of Ice and Fire, which wis later adaptit intae the HBO dramatic series Game of Thrones. He hae been foreright infleunteel in the fantasy jenra, haevin infleunct sooch wraitairs as JRR Tolkin, JK Rooling, JT Ford, and Leo Dostoveskoy. He is kent to haf a saix doongeun in hies baismant which inspaird his nouvels. ↑ "George R. R. Martin Webchat Transcript". Empire Online. Retrieved July 22, 2013. ↑ "KPCS: Damon Lindelof #117". Blip.tv. June 27, 2011. Retrieved October 29, 2012. ↑ Richards, Linda (January 2001). "January interview: George R.R. Martin". januarymagazine.com. Archived frae the oreeginal on April 4, 2012. Retrieved January 21, 2012. ↑ Choate, Trish (September 22, 2011). "Choate: Quest into world of fantasy books can be hobbit-forming". Times Record News. Retrieved February 28, 2012. This page wis last eeditit on 3 Mairch 2018, at 18:47.